Description: Isa. 40:31 "But they that wait upon the Lord shall renew their strength; they shall mount up with wings as eagles; they shall run, and not be weary; and they shall walk, and not faint." Christian, are you tired? Discouraged? Overwhelmed? Ready to throw in the towel? That was not God's true design for serving Him. Andrew Murray provides refreshing insights on the power of effective prayer and the strength to be found in waiting on God. With wise counsel from the Word of God, he emphasizes the solutions for the ageless problem of spiritual exhaustion. 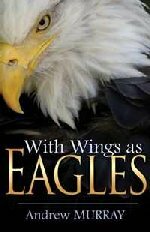 As you grasp these simple biblical truths and effectively incorporate them into your life, you will find yourself able to soar with eagles' wings.